Hilary: “I had an incredible day. At first I was worried if anyone would turn out, but the crowd was great. The run in Whitley Bay, from the Esplanade to Edward’s Road was uphill, but the weather faired up for my group. Everyone was cheering and running alongside. I didn’t believe it was happening until I held the torch. I was concentrating on where to go and waving as I knew that my family and the RSPB team would be watching via the internet. Even now it’s been unbelievably fantastic with people stopping me with congratulations. I don’t even know some of their names. It’s been excellent”. 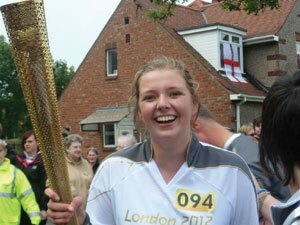 Josie a part time teaching assistant at Amble Links School carried the torch in Berwick on June 14th, the day before it came to Amble. James: “I loved it, it was brilliant and it stopped raining when we ran through North Shields. I was in the same bus as Caitlin. It felt a bit strange at first but I wasn’t nervous. It wasn’t until we actually got on the bus that we saw all of the people lining the street and I thought “WOW”. There were hundreds cheering and waving. People were taking photos and so excited. There were 200 kids cheering me on. I passed the flame on and got back on the bus. It then went quiet. 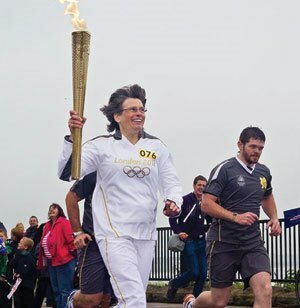 I really enjoyed it and I get to keep the torch. It has pride of place at home. 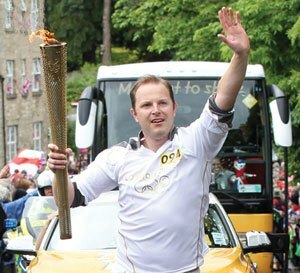 Jamie who grew up in Amble and now lives in North Shields wrote a blog about how delighted and honoured he felt to be accepted to carry the Olympic Torch through Riding Mill on June 16th. 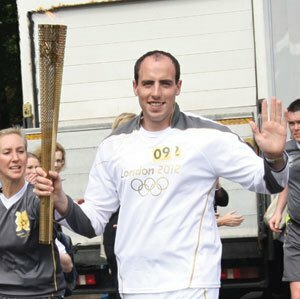 “I was starting to get very nervous about the big day, the fear of the flame going out, dropping the torch! Lots of thoughts were going through my head, not to mention that I’d broken my hand. I held up the torch and started to get emotional but everyone cheered. It was a bit of a blur to be honest. I remember thinking that my grandad would be chuffed to bits and looking up to blow a kiss to him. And off we went. 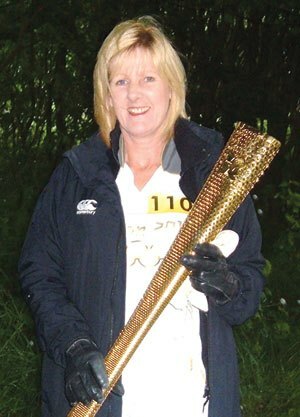 “So after getting off the bus, my torch was decommissioned and I was free to meet up with Jo and the kids.